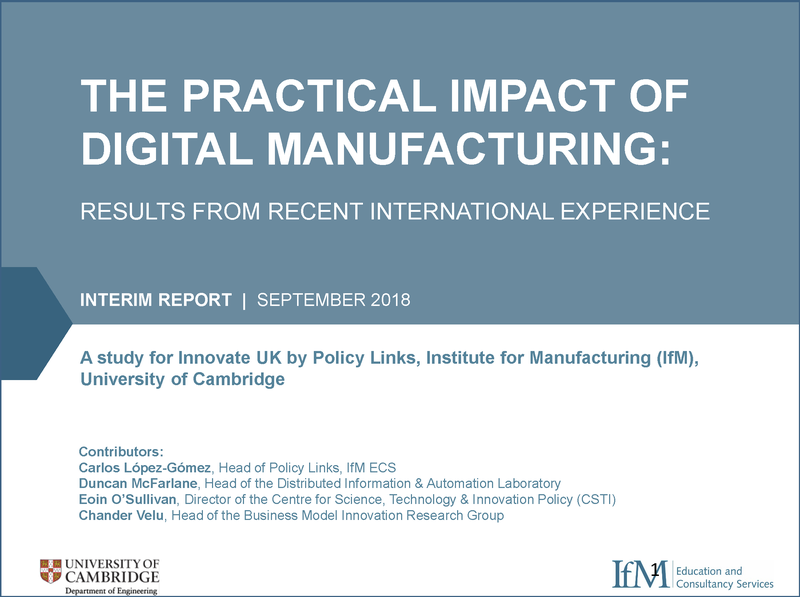 Innovate UK asked Policy Links and the Institute for Manufacturing (IfM), University of Cambridge, to collect and analyse evidence on potential benefits derived from the adoption of digital technologies in the manufacturing sector. The Made Smarter Review estimates that UK industry could achieve a 25% increase in productivity through digital adoption by 2025. However, most estimates to date have focused on the expected impact of digital adoption, primarily on the basis of macroeconomic extrapolations and survey data. This study makes an important contribution by investigating the observed impact achieved by manufacturers around the world when deploying digital applications and solutions across their operations (with a strong focus on SMEs). The report also reviews recent digital adoption efforts and studies in key manufacturing countries, offering strategic insights for future policies aimed at supporting digital manufacturing in the UK.